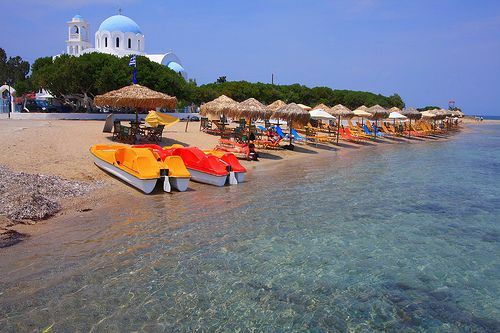 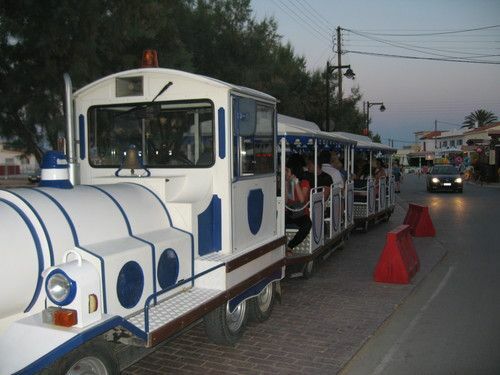 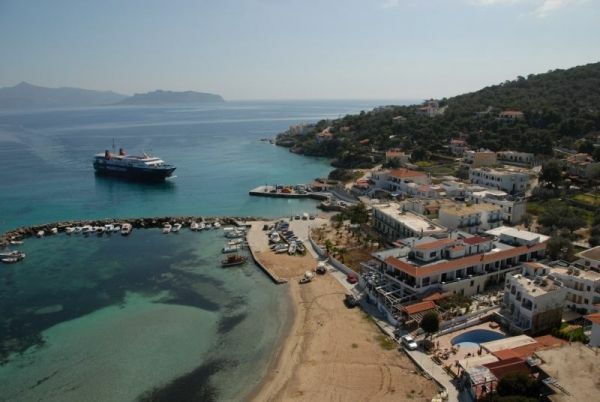 Skala is the main tourist resort of Agistri and the arrival port of all ferries coming from Piraeus (Athen's port). 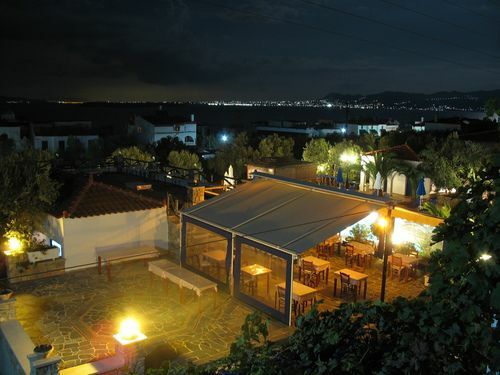 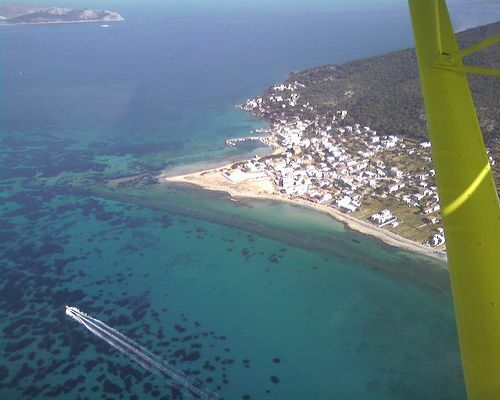 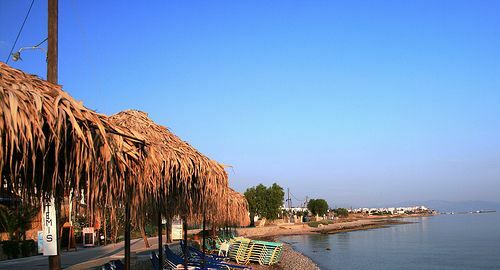 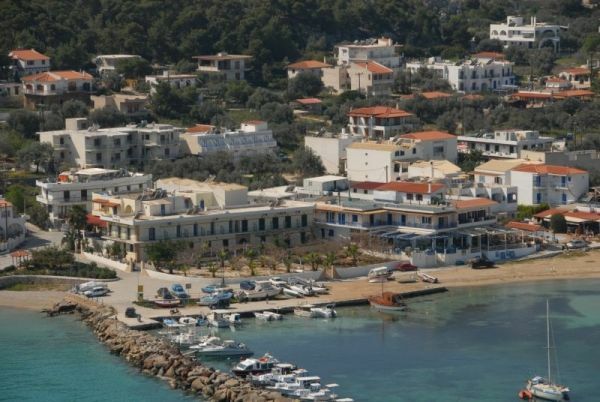 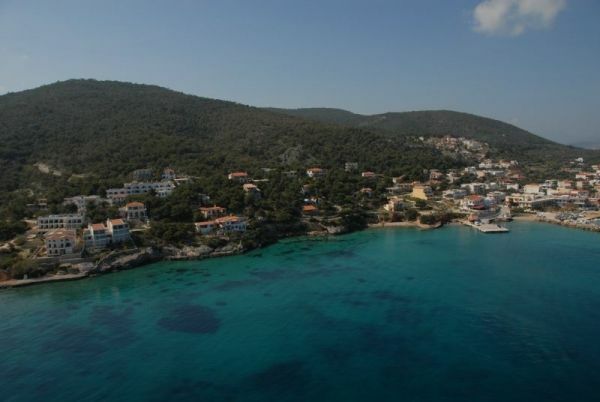 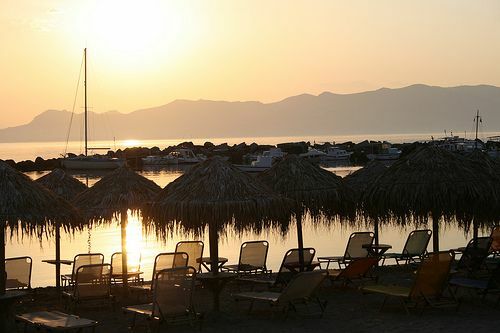 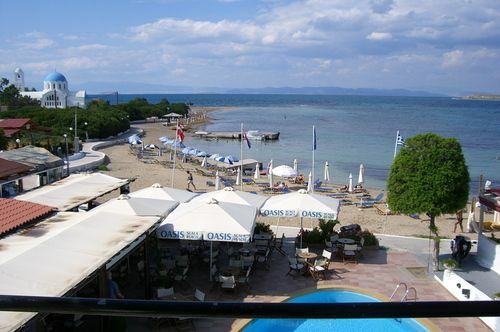 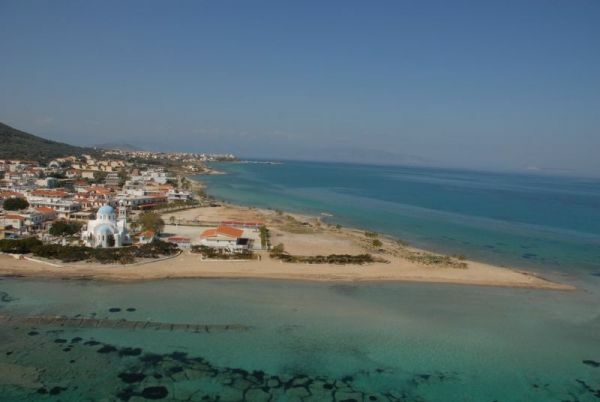 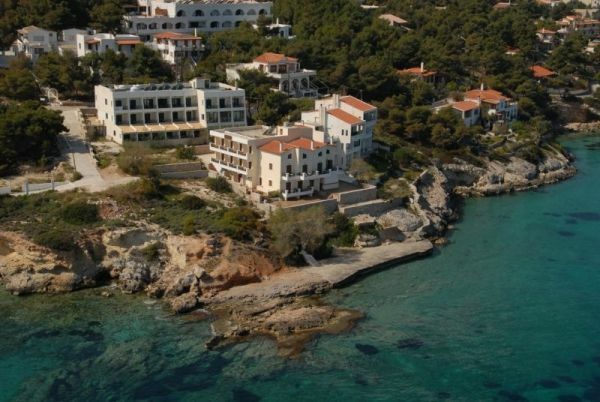 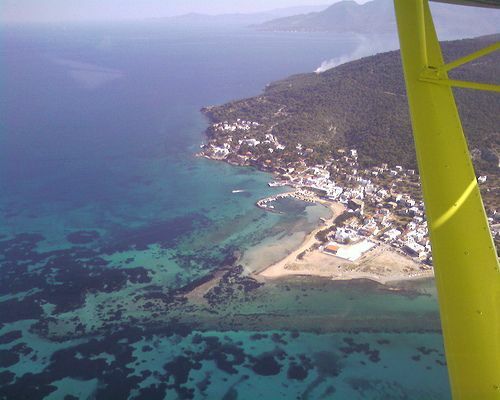 It offers a few hotels and many rooms-to-let, tavernas, cafes and bars, some of them found right on the sandy beach. 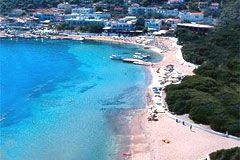 Skala is a quite bustling touristic village without any traditional character but has a magnificient sandy coastline with exotic turquoise waters. 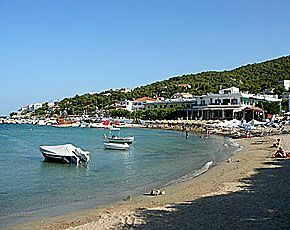 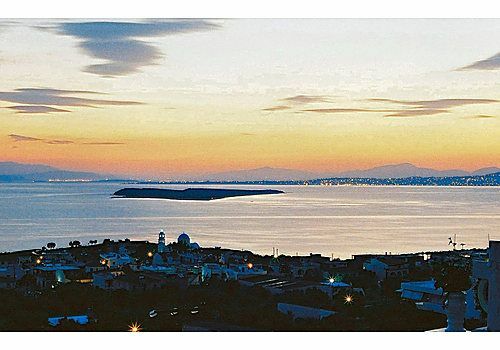 It is conviniently located at a 5-10 minute walk from the idylic Skliri settlement and approximately 2km from Milos (or Megalohori) which is Agistri's capital. 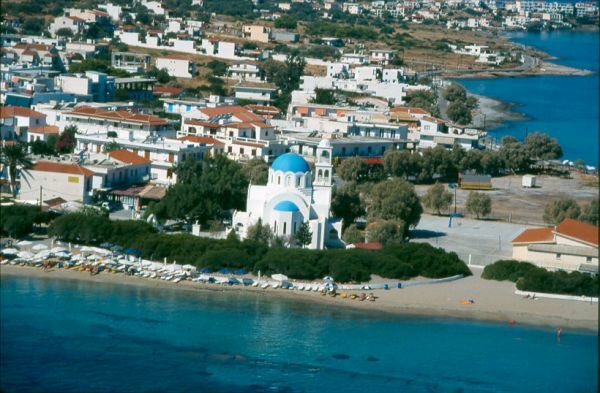 The impressive blue dome of Agioi Anargyri church prevails among the resort's rather plain buildings. 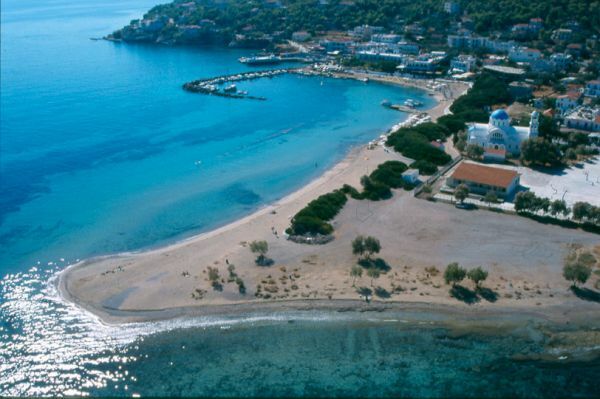 SKALA'S BEACH: Skala has a beautiful sandy coastline with amazingly exotic turquoise waters. 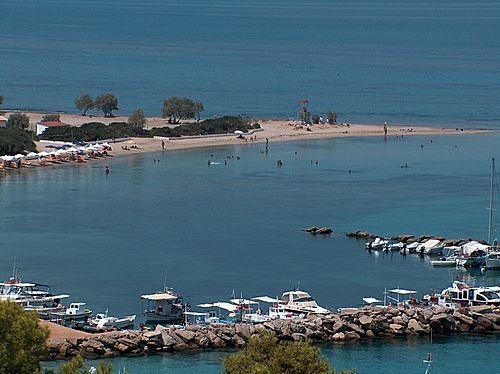 It is one of the most popular beaches in Agistri because it is conviniently located in front of Skala's village, it is well supplied and has shallow waters, ideal for children. 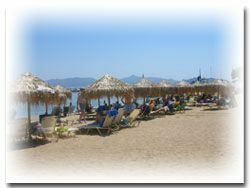 The beach is long but quite narrow and offers some spots with umbrellas and sunbeds and some spots which are not organised. 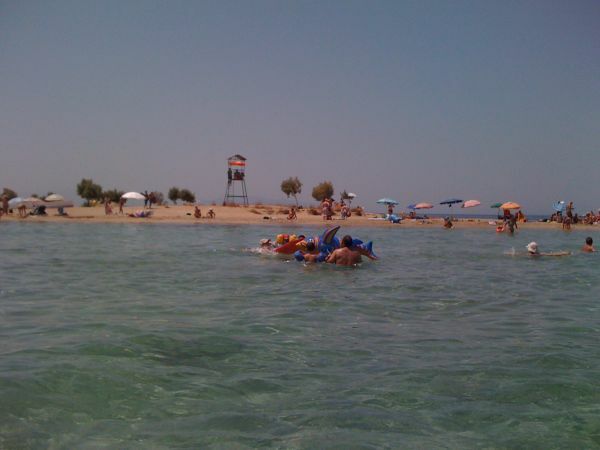 It also offers some water sports facilities. 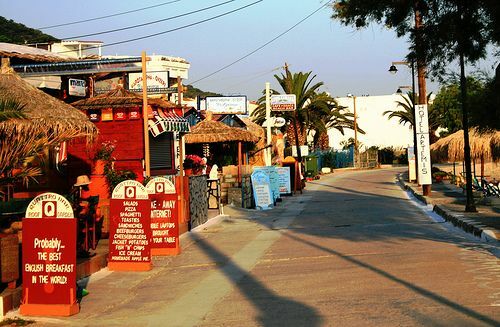 The newly built buildings which are close to the beach spoil its exotic atmosphere. 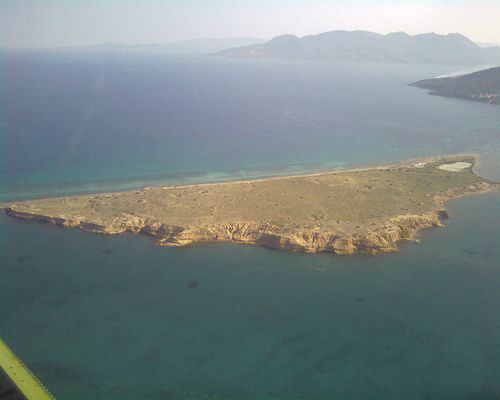 Right opposite Skala beach there is a tiny islet named Metopi, which is popular among those whi have smaller boats. 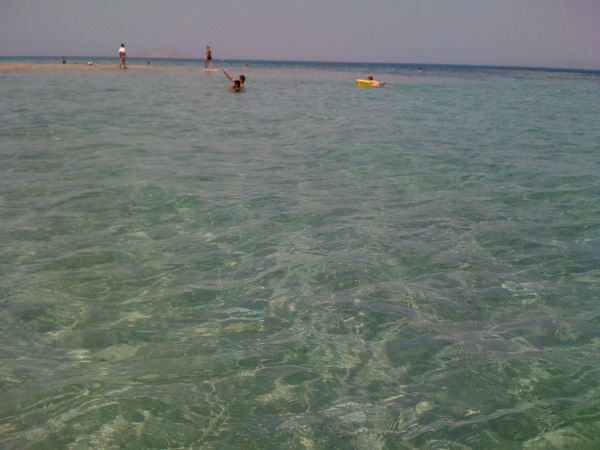 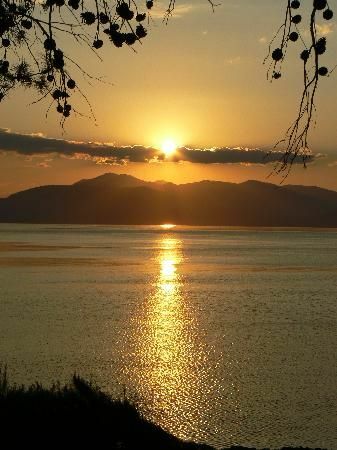 Its landscape is unspoiled with nice waters but the sea shore is not very attractive. 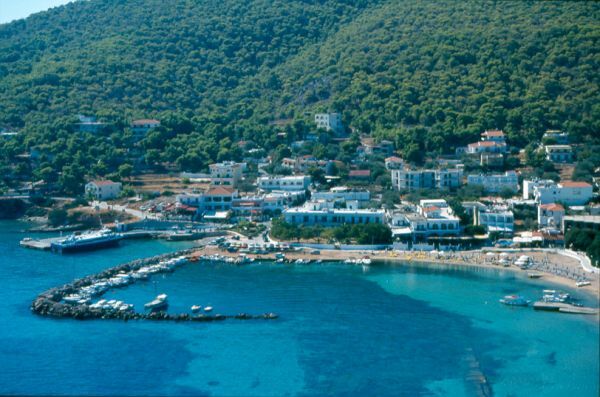 MOORING & ANCHORAGE INFO: Skala is the second port in Agistri, along with Milos (Megalohori). 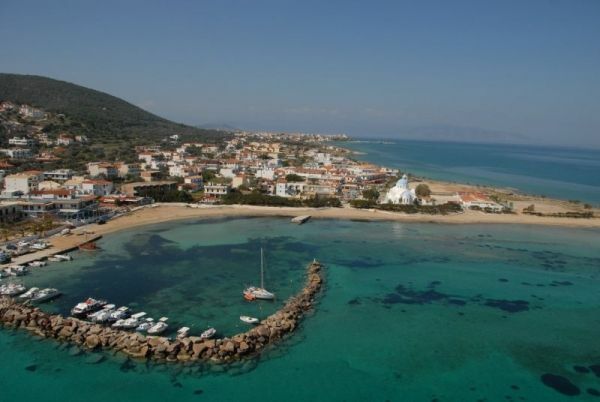 However mooring in Skala's port is recommended only for smaller boats, because it is quite shallow and has reefs right in front of the port's entrance. 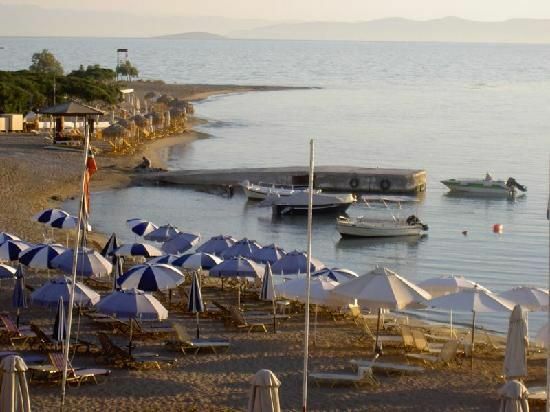 The only place where larger boats can moor is dedicated to the ferries. 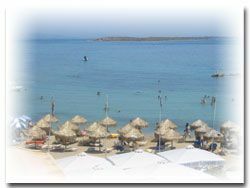 Larger boats can moor in Milos, which has small marina. 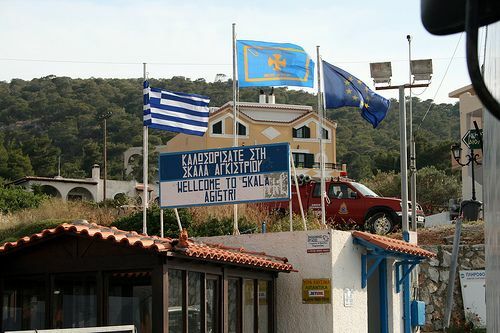 Skala is not protected and therefore it is not recommended as an anchorage. 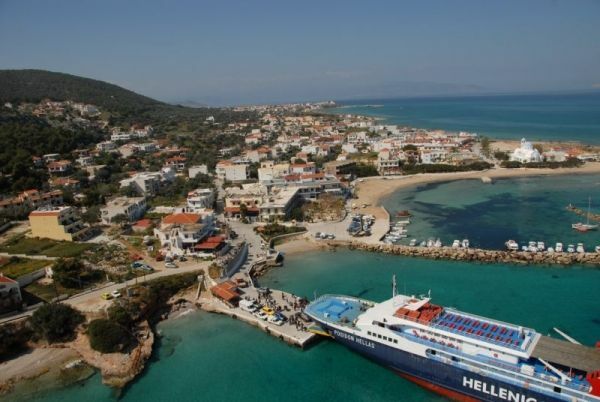 You may anchor temporarily - and only when the weather is calm - on the northern part, next to the ferries' dock with mooring lines tied on the shore's rocks. 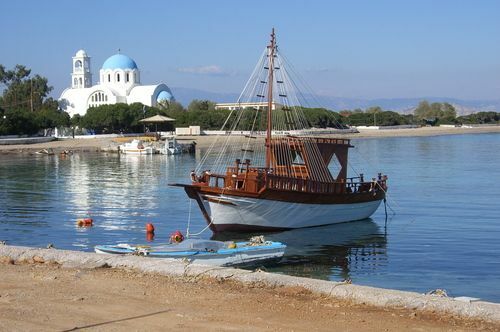 There, the waters are transparent and you may use the tender in order to disembark on the dock.